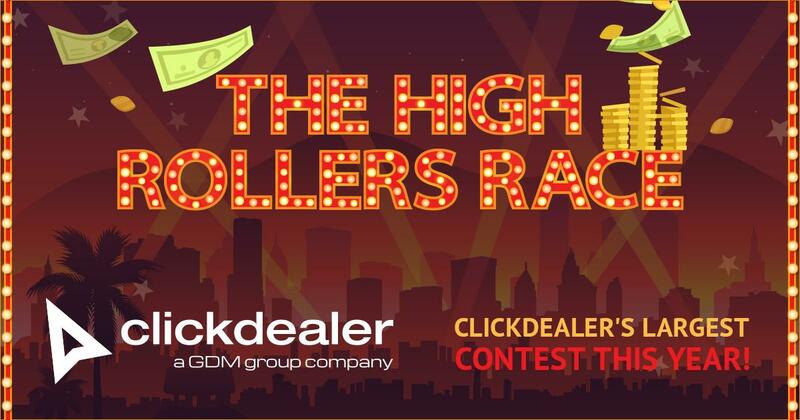 ClickDealer Launches Its Biggest Contest This Year – The High Rollers Race! The first 10 players to crack MGM Grand’s $50000 pot before November 15th are leaving with a free pass to Affiliate Summit West 2018 and entrance to ClickDealer’s exclusive party after the event. Luxor’s $100000 mark gets 3 lucky fellows who reach it before December 15th $2500 in cash, a free pass to ASW 2018, entrance to our exclusive party after the event, and a personal concierge’s services to help plan the trip. Caesars Palace will determine the ultimate winner by maximum revenue before January 1st, and the prizes are $5000 in cash, flights and hotel (3 nights) for 2 to Vegas, a personal concierge’s services for the trip, free passes to ASW 2018, and VIP entrance to our exclusive party. Your reward tier is decided only by your prowess and tenacity, in accordance with the ruthless rules of the Strip. There’s blood in the water and sharks are closing in, so don’t hesitate another minute and join the race!